Those of you who follow MMA and the UFC have undoubtedly witnessed the unstoppable ascension of featherweight Conor McGregor. His breathtaking, light-speed victory over Jose Aldo last Saturday was nothing short of magic. Naturally, his stunning performance was the result of years of mindful, dedicated movement study and practice. His recent training with our friend and movement expert Ido Portal has tremendously intrigued the whole MMA community and it’s fans, and raised many questions. With Conor’s dramatic win, it looks like everyone is on fire with the “movement” buzz word. Many people are asking: What is it all about? Is movement training some new trend or is it for real? Is it the future of MMA? Of course it’s for real, and yes, “movement” is the future of MMA. The explanation is simple: fighting is movement. Improve a fighter’s overall movement abilities and you’ll improve his fighting ability. Classically, MMA training revolves around specific, yet integrative training in various martial art disciples, including a mixed bag of the many striking and grappling arts. Supplementry strength and conditioning development is added to the mix, which is one of those indispensable aspects of elite sports training that is obviously very well established. So where does movement training fit in the picture of developing a world class fighter? The answer is two-fold: Movement training can be general to improve a fighter’s general movement language and skill. It can also be focused on targeting particular movement deficiencies in a fighter, as well as addressing very specific aspects of movement required for a particular strategy. In fact, Conor McGregor is one of a select few intelligent and forward thinking fighters who understand the power -and the “natural” performance edge-of training the bigger spectrum of movement. You can learn these movement techniques too, we teach the basics at workshops around the world. Teaching movement is what MovNat does. When I started coaching MMA top-ranking fighter and UFC belt contender Carlos Condit early February this year, my proposition was simple: “MOVE better, FIGHT better.” I reached out to him at a time when he was still recovering from one of the worst injuries any athlete could undergo, a torn ACL. Many people thought he was done-that he would never be the same-that he’d never return to the level he was before. I had a different view on it because I have dedicated my life to the study and practice of movement. I knew that he could return as a better athlete and fighter if he was to train movement, not just MMA. Beyond the progress that could be seen in training, his devastating victory over Alves definitely proved that not only had he completely recovered from his injury, but that he had re-emerged as an even more effective and threatening fighter-ready to compete for the title. He was in no way a washed out, declining fighter-he was a force to be reckoned with, and still one of the most dangerous fighters of his division. The hard work he put into his regular training (Carlos is surrounded by a team of amazing, world-class coaches) plus the specific MovNat training we did together paid off beyond expectations. The movement principles I trained Carlos in are the same principles we teach at MovNat workshops around the world. Find upcoming workshops here. If you are a fitness professional interested in teaching these concepts to your clients, find a certification here. It’s a great line from Conor McGregor, quoted from his post-fight interview, and it could be summarized in a single word: efficiency. In the context of a highly chaotic environment, with so many unpredictable variables (which is the hallmark of a fight) the supreme key to efficiency isn’t just impeccable technique itself, it is adaptability of movement. So here we are: “movement” is a new, hot concept the whole MMA world is now really paying attention to. It is what I’ve been calling “the missing link” of MMA. There are the strikes, the kicks, the takedowns and submissions…but we are just now becoming fully cognizant that it’s the movement-everything that materializes in between the techniques-that allows the fighter to deliver those techniques effectively, efficiently, and in the crucial moments which decide victory or defeat. Maybe the time has finally arrived that we come up with a new definition of the MMA acronym: “Mixed MOVEMENT Arts.” Because movement is really what high level performance is about. Martial arts techniques are the foundation of MMA, but movement itself – and as far as I am concerned, Natural Movement – is the foundation for martial arts, and for any other sports for that matter. Movement training is undoubtedly the missing component of MMA training- and the future of it. It’s the glue that will link all the training aspects of the game into one single, highly adaptable craft. GSP, Carlos Condit and Conor McGregor have understood it before most other fighters in the game, but I predict that many more will follow their tracks, and that movement experts, all with their own approach and methods, will soon find themselves in high demand. Teach Movement – find a certification. Found your site after Joe Rogan played a video of Condit talking about your training methods on his podcast. Very very interesting stuff, enjoying reading your articles! I think the mindset of ‘movement’ is a lifestyle that can contribute greatly to anything. I’m a policeman and I’m totally rethinking my approach to the unfortunate circumstances that require hands on approach. Thx for sharing. If you look at what Ido Portal does its just basic Calisthenics, bodyweight exercises and gymnastics. He has not re-invented the wheel despite his claims he has a “unique system” Plus his arrogance really puts me off. That is something that has been said about MovNat as well. I agree 100% that the purpose isn’t to reinvent the wheel, it isn’t. The purpose is to make that wheel SPIN again, better, and faster. A person or method who inspires more people to move more is exactly what modern society and people need at the moment. Yoga, CrossFit, obstacle course races, the MMA trend, MovNat of course, they/we all participate to having people move more, understand the value of movement, and experience the joy of it. They all contribute to keeping the wheel of MOVEMENT (“natural” or else) spinning. Then it is really a matter of finding the right approach or method, “right” being what works best for you, and satisfies you the most. 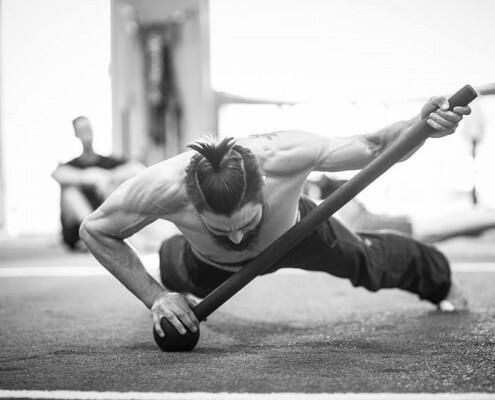 Some do CrossFit, some do yoga, some do rockclimbing or parkour, some do MovNat, some follow Ido, some follow no one, some do it all. It is all good ;).